Mooch is doing the quirkiest notebooks that have the cutest designs and paper pens that write beautifully. All their products are completely handcrafted and have such a vintage vibe. Their notebooks come with witty one-liners and funky illustrations on them. They also do paper pens that look gorgeous and write beautifully. These pens are rolled in different kinds of khaki paper (we love the tribal pattern ones). 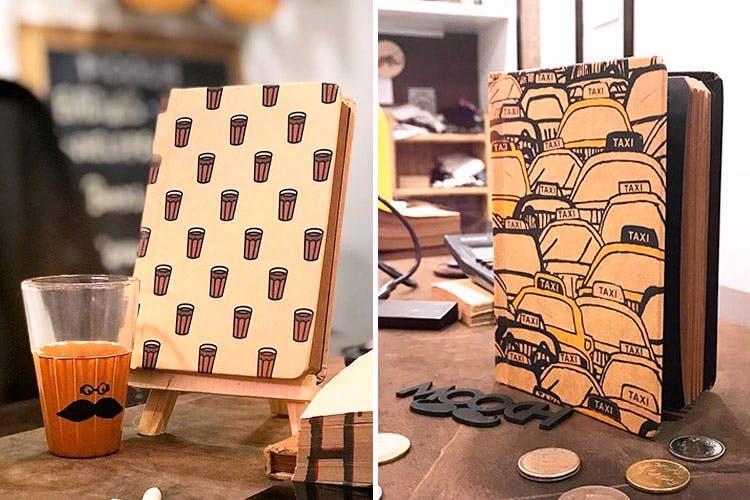 We're in love with their notebooks, with little chai cups, Nutella bottles, rikshaws, paw prints, their graphic golden retriever one (the colours look stunning), and the 'Oh Shoot', accompanied by an illustration of a camera on it. They even offer the nicest personalisation for their notebooks, and we're not talking about the tacky kind with initials and names on them—give them a nice photograph or an illustration you've been eyeing, and they'll do it for you. We'd like to see more colourful designs.